3D printing has exploded in popularity. Ten or fifteen years ago, there weren’t many 3D printers in home use. Today, they’re everywhere. Hobby and home use CNC routing and milling is perhaps 5 years behind in this trend, but it’s catching up at a rapid pace with companies like ours decreasing prices and increasing availability. Let’s talk semantics. CNC is “computer numerical control.” Technically speaking, 3D printers, lasers cutters, waterjets, CNC mills, and CNC routers are all “CNC machines.” In maker community parlance, however, “CNC machine” usually refers to automated machines with a spindle or router that cut or drill a material. This brings us to another definition. These types of CNC machines are “subtractive.” They are taking material away (subtracting) to obtain the desired geometry. 3D printers, on the other hand, are “additive” in that they are building up to the desired geometry. Both technologies are here to stay because both have some strengths that the other technology lacks. Yet, I often see people using 3D printing in applications that are just begging for a subtractive manufacturing solution. Let’s compare 3D printing with CNC along five factors: cycle time, geometry versatility, material choices, setup time, and maximum part size. This happens to be a fidget spinner body. It’s about 2”x2”x0.25”. Let’s suppose you wanted to print this in ABS plastic. 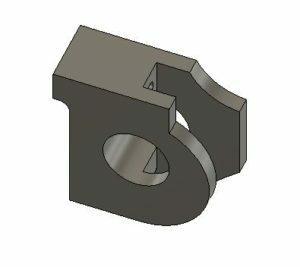 On a 3D printer, depending on the settings, this part would take anywhere from 15 to 45 minutes. On our CNC machines, this is a really quick part. The Power Route could finish it nicely in perhaps just 20 seconds while the M3 might take a couple minutes. I once met a man whose son had started a successful fidget spinner business. This kid was apparently the kingpin of the spinner trade in his school system. The dad explained that he had about 10 printers in his house that they ran constantly to keep up with demand. In a use case like this, one of our machines could have probably replaced all ten of their 3D printers and had capacity to spare. 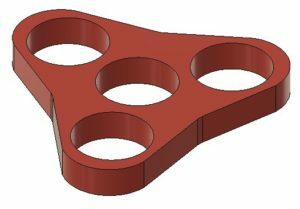 Geometry versatility refers to the different kinds of shapes and parts a tool can produce. 3D printing edges out CNC on this factor. Printers have the ability to create overhangs in parts that a 3 axis (and even a four axis) CNC machine just can’t reach in a single setup. Features on multiple faces will require turning the part to “face” the cutter in a CNC application. This proves difficult when there isn’t an easy way to register and clamp the part you’ve already partially cut. 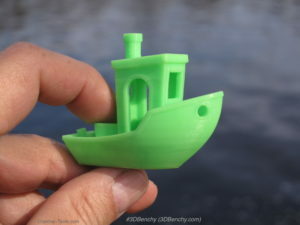 3DBenchy on Thingiverse is a good example of the kind of parts that are difficult for CNC machines to make but relatively easy for 3D printers. A 3 axis CNC machine isn’t completely down and out in this category though. With a little creativity when it comes to fixturing, you can make some seemingly feature-rich parts. 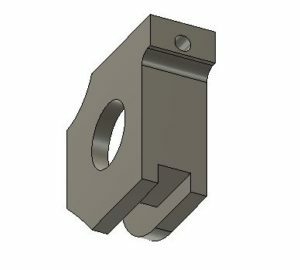 For instance, the part shown below can actually be cut in just two workholding setups. A 3D printer can make this part too, but it’s going to take longer and would have to print support material that you’d have to break off or dissolve away later no matter which way you orient the print. CNC wins hands down on this factor. Most home 3D printers are going to limit you to materials like ABS, PLA, and Nylon. Sure, there are some exotic materials like “wood filament”, but its just bits of dust with special binders. With our CNC machines, you have a ton of options. You can cut wood, plastic, composites, and metals. We normally advertise our machines as only appropriate for softer metals like brass and aluminum, but there are a ton of customers who have put our machines up against hard metals like stainless steel and titanium with great success. The range of materials that you can cut with a CNC machine opens doors for both artistic works and practical parts. CNC inherently involves some more setup time than 3D printing. As a 3D printing enthusiast myself, I sometimes get spoiled on just dropping the model into my slicer of choice, tweaking a couple parameters, slicing, and hitting “go”. There’s just more to designate with CNC milling or routing. You have to decide which cutter is best for which feature, how fast and deep you should feed into the material (we have a calculator for that here), whether or not your cutter will hit your clamps, and a few other considerations that aren’t of concern in 3D printing. Last week’s blog post covered seven successful workholding methods that might help you choose the best and quickest setup method for your project though. The winning technology for this factor depends on which dimension you are interested. If your designs are all particularly tall, 3D printing has the advantage. Many 3D printers have 6 inches or more of Z height, while most hobby and light commercial CNC routers are well under that. The M3 has about 2” of Z clearance, while the Carve King outshines its common competitors with 4” of Z clearance. The Power Route boasts 5”. I like to think that four or five inches of Z height is more than adequate for most subtractive parts. CNC routers are the clear winner when it comes to X and Y dimensions (think length and width). While there are some large format 3D printers, most printers sold today are under 10×10”. Our smallest machine, the M3, sports a little more than 10×10 inches in XY movement range. The Carve King can move a little over 17×17”, while the Power Route comes in at 25”x25”. An added benefit to CNC over 3D printing is that your part size isn’t necessarily limited to your work area. With each of our machines, you can perform what’s called “tiling”. This involves cutting the features that are within the machine’s travel range, then sliding it down to cut more. We carry Vectric VCarve Desktop that has a toolpath tiling feature that will generate code for different sections of your large part. CNC isn’t going to displace 3D printing anytime soon (nor should it), but I think there will be a ton of CNC converts in the years to come as printing enthusiasts discover the advantages of CNC machines. CNC offers tremendously faster cycle times, a world of material choices, and often the ability to make much larger parts. If you are a printing enthusiast who is looking to improve your “making” skills, I suggest you check out our store to see if one of our CNC machines fits the bill. Here is an extra little detail very few people talk about. If you have a 3d printer, particularly an auto-leveling printer, and it consistently can be +0.2mm or -0.2mm that is enough to have your 3d print fail to stick to the bed. If your CNC router is off by that much, you will still in most cases end up with a usable part (best to have a little extra stock for that reason). That is exactly why after a month of having a very nice 3d printer I could never get more than one or two prints in a run without something going wrong, yet after a month of having my CNC router up and running I was already carving custom aluminum brackets for a friend’s electric mountainboard. Material costs were almost the same between 3d printer plastic and aluminum sheet so it was definitely a win for me. Fascinating. I have 4 3D printers – even a resin one. I need to learn CNC! Where is the best place to start? Accuracy is another advantage of CNC, my Power Route has a resolution of 10 microns, 3D printers are at least ten times that. Also finish, a 3D surface on CNC requires virtually no sanding, not with a 3D printer which build up z layers and leaves a stepped surface on curvy areas. Material waste goes to the additive process of 3D printing. CNC generates lots of chips and sawdust plus the perimeter areas not cut. Subscribe to receive promotional offers and updates from the MillRight CNC team. Have questions or comments? Click the link below or call 229-234-1063. Have a look at this shopping cart on MillRight CNC's website sent to you buy a friend or loved one.